From Lawrenceburg, take SR 1 to R on Mt Pleasant Rd to R on Ruth Ave. Last house on the Left. Sign on. 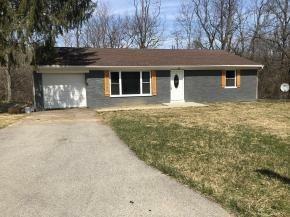 This 3BD/1BA home on just under 1/2 acre. Fully rehabbed w/new kitchen cabinets, brand new appliances, refinished hardwood flooring through living room and hallway. New carpet in all 3 bedrooms. Full unfinished basement and is in the Sunman-Dearborn School district. It won't last long. Priced to sell! Owners are both licensed real estate agents.